Have you ever been to Cornwall, that romantic coastal county in the southwest of England? If so, you've probably seen the remains of tin-mine smokestacks poking up from the landscape. Cornwall was one of the world's leading tin producers until the world market collapsed in the mid-1980s, largely due to the switch from using tin in food cans and packages to alternatives such as aluminum and plastics. Despite this, tin remains an important metal in many other products and industrial processes, from welding and soldering to coating roofs and making insecticides. Let's take a closer look! Photo: The engine house from a ruined tin mine in Pennance near Redruth, Cornwall, England. After the last Cornish tin mine closed in 1998, the industry is now just a romantic memory. Photo by Tony Atkin, published on Geograph in 2006 under a Creative Commons (CC BY-SA 2.0) licence. Photo: Cats on a hot tin roof. 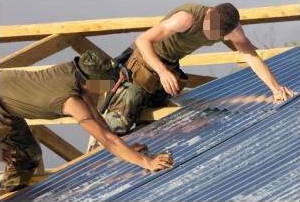 Two engineers put a new tin roof on a school in Kenya. Photo by CPL Bryant V courtesy of US Marine Corps. Tin is a silvery white metal that lives in group IV of the periodic table of chemical elements. To look at it, you'd never know that it was (according to archeologists) one of the earliest and most important metals in human history! It was the discovery of how tin and copper could be combined in an alloy called bronze (a much stronger material than either metal alone) that ushered in one of the major eras of civilization: the Bronze Age. The earliest evidence we have of people using tin is in bronze finds from 3000–3500BCE, though it was apparently not widely used as a pure metal until several thousand years later (probably c.600BCE). 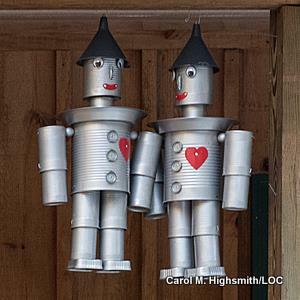 Photo: "Tin can" is a bit of a misnomer because cans aren't made entirely of tin. Tin cans are made of tinplate steel (steel electroplated with a thin coating of tin) or sometimes even of tin-free steel. According to the Can Manufacturers Institute, the amount of tin used in cans fell by some 60 percent during the two decades to 2013. Although we think of tin as an everyday material, it's actually much less common than comparable metals such as copper or zinc (according to the US Geological Survey, copper is over 30 times and zinc about 50 times more common than tin). In terms of abundance, tin is roughly halfway down the list of chemical elements: the 49th most common in Earth's rocky crust, existing in concentrations of about 2 parts per million (0.0002 percent). In other words, if you dig up a tonne of rock, a measly 2 grams of it will be tin! There are tin deposits right across the world, though most tin now comes from the southern hemisphere—and chiefly from south-east Asia. The most important producer countries are now China, Indonesia, Peru, Bolivia, and Brazil. England (Cornwall) is no longer the important producer it once was and the United States, despite being the world's biggest consumer of tin, has not (according to the US Geological Survey) mined any of the metal since 1993. World mine production of tin, 2018. Six countries (China, Indonesia, Burma, Brazil, Bolivia, and Peru mine about 90 percent of the world's tin. Source: USGS Mineral Commodity Summaries: Tin, January 2018. Most tin is produced from an ore (raw rocky mineral) called cassiterite, which is turned into tin by smelting. First, the ore is crushed to a powder and washed free of impurities before being heated with carbon (in the form of coal) and limestone in a giant furnace. Other metals, such as iron, copper and zinc, separate out. Molten tin sinks to the bottom of the furnace and is shaped into solid blocks known as ingots. Like most other metals, tin can also be separated or purified using electrolysis (an electrical-chemical process that works in the opposite way to a battery). There are two common forms (allotropes) of tin that look and behave differently because of their quite different internal crystalline structures. One is the familiar, silvery-white form called white tin or beta tin, which has a body-centered tetragonal structure and predominates at everyday temperatures. The other form, gray tin or alpha tin, is powdery, about two thirds as dense, and appears spontaneously at low temperatures. It's less useful because it's weaker and more brittle, with a face-centered cubic crystalline structure. The sudden degradation of white tin into gray tin is called tin pest. Photo: Tin surprise! 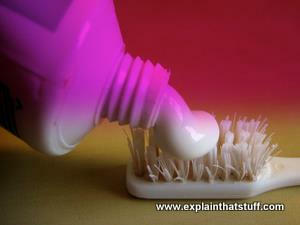 Did you know that tin (II) fluoride puts the fluoride in toothpastes? Tin is a typical metal inasmuch as it's extremely malleable (easy to work in many different ways), ductile (easy to draw into wires), and readily forms a grayish protective oxide on its surface, but it's much weaker than metals such as iron so it's not used as a construction material. It has a relatively low melting point (one of the reasons it's used as a component of solder), but a relatively high boiling point, which means it's a liquid over a wide range of temperatures and can be usefully employed as such in a number of industrial processes. 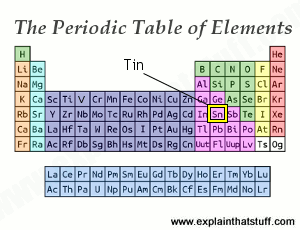 Tin has a valency (chemical combining power) of either two (II) or four (IV) and accordingly forms two different forms of compounds: tin (II) compounds (which used to be called stannous) and tin (IV) compounds (formerly called stannic). Notable tin compounds include tin (II) chloride used in galvanizing, dyeing, and perfume production; tin (II) fluoride, which provides the fluoride in some toothpastes; and tin (IV) oxide, an industrial catalyst. Compounds of carbon and tin include a number of important insecticides and disinfectants. Artwork: The periodic table of chemical elements showing the position of tin. Being reasonably far down the table, it's moderately dense and heavy (just above lead, Pb). Atomic number: 50 (the most common form of tin atom contains 50 protons, 70 neutrons, and 50 electrons). Density: White tin: 7.28 g/cc; gray tin: 5.75 g/cc. Isotopes: Ten stable isotopes, the most common of which are tin-120 (~33%), tin-118 (24%), tin-116 (~15%), and tin-119 (~8.5%). 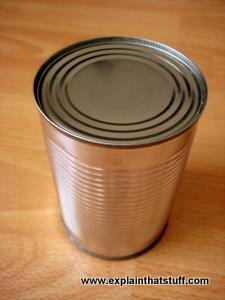 Photo: Tin is still used in cans and containers, but much less than it used to be. From: Carol M. Highsmith's America Project in the Carol M. Highsmith Archive, Library of Congress, Prints and Photographs Division. Chart: Tin use in the United States in 2017. The US no longer mines or smelts any of the tin it uses. 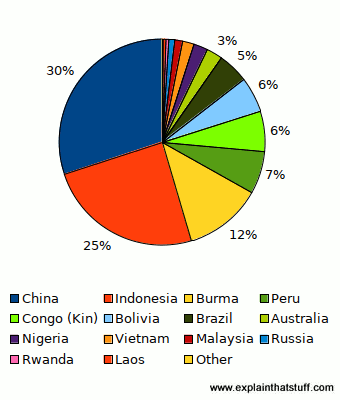 Roughly a third of US tin comes from Peru, with much of the rest coming from Indonesia, Bolivia, and Malaysia. Source: USGS Mineral Commodity Summaries: Tin, January 2018. Tin plating was—and remains—the most important use of tin. It involves applying a very thin protective coating of tin to other materials, such as steel and copper, either by dipping them into molten tin or by electroplating. The dull, tin oxide that forms on the surface of the tin plate protects both the tin and the material it covers up. In the early decades of the 20th century, most food cans were handmade this way and sealed up by soldering. The tin rustproofed the steel cans and protected them from acidic foods, and some tins cans also had an enamel coating inside to protect the food from reacting with them. Now, plastic, board, and composite containers and aluminum cans often do the job instead. Tin is also used to rustproof such things as paperclips, hair grips, and safety pins. 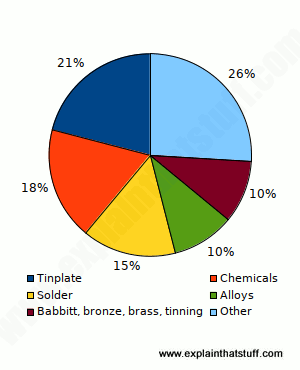 Apart from tin plate, the next most important use for tin is the production of many different alloys, including bronze, solders of various kinds, babbitt metal, and pewter. Tin: Packed with interesting information, this is a longer introduction to tin from Wikipedia. USGS Minerals: Tin Statistics and Information: Detailed and definitive information about world tin production and trends, though the emphasis is on tin use in the United States. Tin and Global Capitalism, 1850–2000: A History of "the Devil's Metal" by Mats Ingulstad et al (eds). Routledge, 2014. A series of papers on the economic and military importance of tin. Chemistry of Tin (2nd edition) by P.J. Smith (ed). Springer Science, 2012. Tin and Tin Mining by R.L. Atkinson. Shire/Bloomsbury, 2010. A fascinating (if brief) historical account of tin and how people have extracted it, from ancient times to modern. Tin Chemistry: Fundamentals, Frontiers, and Applications by Alwyn George Davies, Marcel Gielen, and Keith Pannell. John Wiley and Sons, 2008. Tin: Its Production and Marketing by William Robertson. Taylor & Francis, 1982. Tin by Janet Levy. Rosen Group, 2009. A 48-page introduction covering the history of tin, its atomic structure and place in the periodic table, how it's mined and processed, its various compounds, and how we use it in everyday life. Ages 9–12. Tin by Leon Gray. Benchmark Books, 2004. A basic 32-page overview of the chemical element tin, its physical and chemical properties, and its various uses. Ages 9–12. The story of how the tin can nearly wasn't by Tom Geoghegan, BBC News Magazine, 21 April 2013. A fascinating history of tin cans and canning.